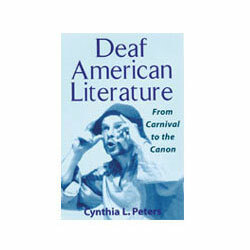 The author chronicles the evolution of ASL literature from underground performances on literary nights to its rightful place in the Western literary tradition in Deaf American Literature. Cynthia Peters applies her analysis to the craft's landmark works, including Douglas Bullard's novel Islay and Ben Bahan's video-recorded narrative Bird of a Different Feather. Deaf American Literature, the only work of its kind, is its own seminal moment in the emerging discipline of ASL literary criticism.